Our customers love us for a reason... find out for yourself. This 35 minute QuoteWerks video covers the core QuoteWerks features. For videos on CRM/PSA integrations, visit the CRM/PSA Integrations page. Helpful Hint: After taking the tour please visit our IT Community page. 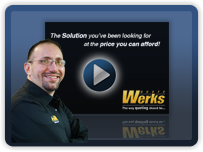 Our IT Community page includes everything you need to know about using QuoteWerks in the IT Industry.